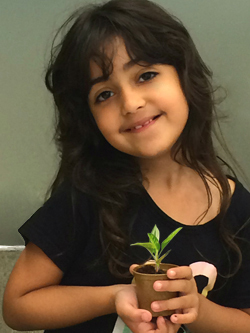 Community gardening/farming can be fun for kids. By being creative on the garden plot, you’ll give the neighbourhood kids incentives to join in on the activities. All over the world community gardens and farms are sprouting up with organizers devising playful ways to engage local children so that they not only get involved now, but become long-term contributors to the self-sustaining community initiative. Let’s take a look at some fun ideas from around the globe that can be applied to your own local project. You’re probably familiar with the corn mazes that exist within many agricultural landscapes across North America. They draw crowds from all around as tourist attractions alone. If you have enough space this concept can be applied to your community garden, at a smaller scale, even if it is more playful than challenging. Anything from a small corn field (optimal) to a low-laying strawberry patch will do, as long as there are rows that can be planted to form a maze. If using produce to produce the maze proves too difficult you can simply set aside a plot of land and plant tall-growing grass to form the maze (as pictured above in the community garden of Dean City Farm in the UK). Adding fun planting beds using repurposed items that kids enjoy make for a great addition to any community garden. 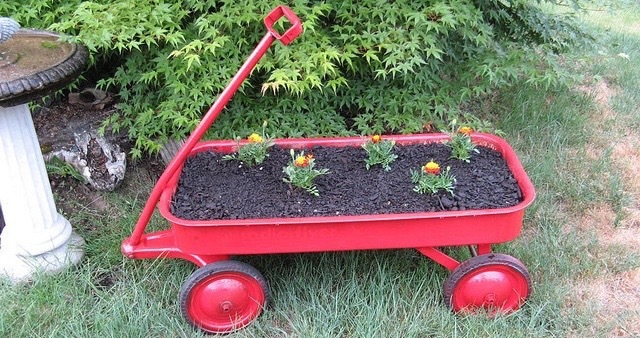 For example, a classic red wagon (pictured above, courtesy of themicrogardener.com), large toy construction trucks, and even plastic race-car beds that kids have outgrown provide ample space for planting. Even without recycled toys you can get creative with planting beds, as seen at the Penn Yan Community Garden in New York where they’ve used beds to create a series of train cars for kids to enjoy. The possibilities are endless when you apply a child’s imagination to this concept. Get your community’s little Picassos involved in your local garden/farm project by arming them with brushes and paint. Having children paint the picket fence (example above found on Pinterest community garden board) protecting the community garden will allow them to contribute while getting their creative juices flowing. The fence can be repainted semi-annually/annually to keep things fresh. This concept also adds a fun splash of color to the neighbourhood. 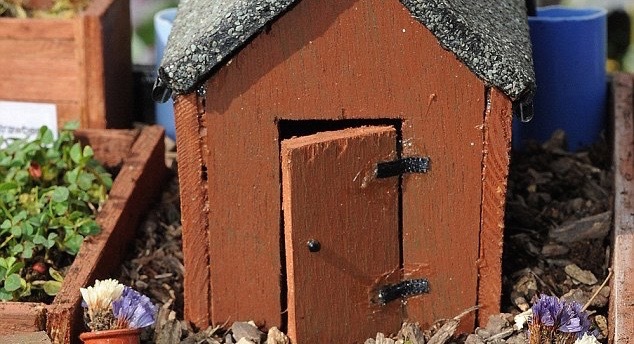 There was a great little news story from the Daily Mail two years ago, where a grandmother managing a local community garden created an exact miniature replica of the garden she tended to (snippet pictured above). The concept of creating miniature villages (w/gardens) within community gardens/farms for decoration is not a new one, yet is rarely used as a means to capture the attention of children. Helping establish these tiny environments within larger ones will give kids a fun and engaging way to express their creativity while taking on the responsibility of maintaining a “zone” exclusive to them. They will toil away in the soil for hours so be warned, you may have a hard time getting them to leave the garden when dinnertime approaches. You can buy age-appropriate miniatures from a local home & garden retailer, a craft shop, or even aquarium supply store. Do you have any fun ideas of your own to get kids excited about community gardening and farming? We’d love to hear from you via a direct message on the Plant a Seed & See What Grows Facebook page or Twitter profile.